O’Connor’s success speaks to how her works are intriguingly unique and expertly drawn. Her figurative artwork is particularly distinct in its subject matter: her paintings show women floating in water at curious angles, their faces slightly obscured or hidden. 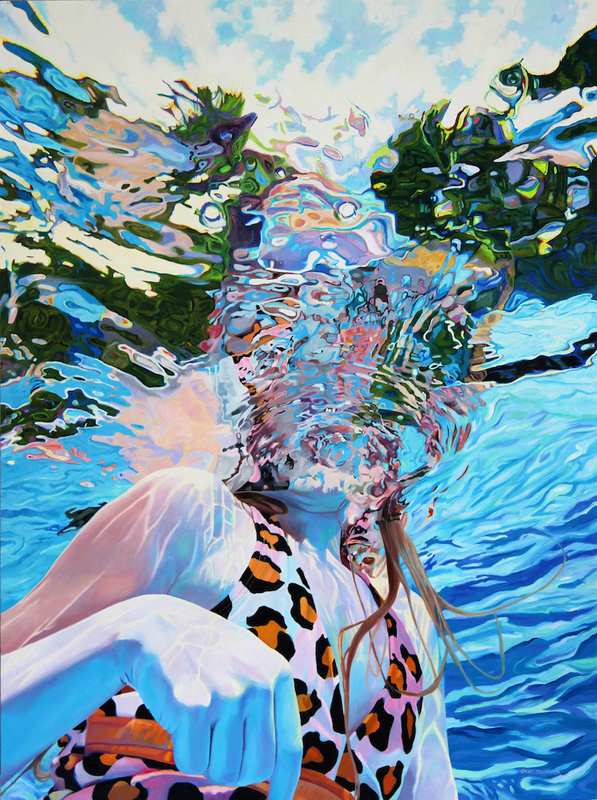 To achieve her realistic water effects, O’Connor admitted that she first works in abstract. “The [realistic] water reflections have benefited from a lot of abstraction, and [the abstract works] always tie to a realistic piece I’m working on.” However, O’Connor has no plans to share these private abstract works with the public: “It’s a personal journey at this point,” she explains. Right now, O’Connor plans to use her fellowship to travel and work on her figurative art. With her fellowship, O’Connor plans to visit New Mexico and the desert, since her artwork always benefits from travel. “Oddly enough,” she explained, “the desert is how my water pieces started.” Alone one night in Marfa, Texas, O’Connor was sitting beside the illuminated pool. With nothing but the night sky, the desert, and the swimming pool in view, O’Connor’s fascination with water began, and inspired her current artistic style. But before her revelatory night in Texas, O’Connor tried to find a “logical career” in pathology. Finding herself constantly drawing what she saw under the microscope, such as bones and anatomy, O’Connor found her passion for art: “I have to [create art]. It’s too critical to me as a human being,” she expressed. At the start of her art career, O’Connor primarily painted landscapes, until the market crash in 2008 halted her sales. Viewing this as a new opportunity, O’Connor wanted to create art that was not considered “commercially marketable” at the time, and so began her fresh concept of female figurative drawings. “With what’s happening politically and visually…drawing women is my way of putting women out there,” she said. “I want to show women as strong…women with careers, mothers, older women. We don’t value them the way we should.” With her fellowship, she hopes to create artwork that addresses how we view female culture, especially by featuring women of all body weights and types. Kat O’Connor is currently featured in our annual 2018 Summer Members Show: Anchors Aweigh. Read more about her on her artist page.